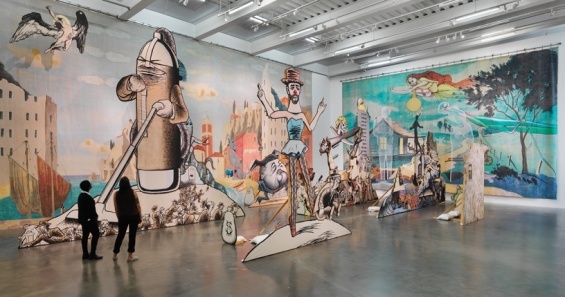 Join us for a family workshop offered in conjunction with the exhibition “Jim Shaw: The End is Here,” the artist’s first New York survey exhibition, on view from October 7, 2015 to January 10, 2016. Navigating Shaw’s Labyrinth: I Dreamt I was Taller than Jonathan Borofsky (2009), a large, immersive installation of sculptures and painted theatrical backdrops located on the Fourth Floor, families will have the opportunity to play a museum-scaled game of I Spy. After writing about the objects and characters they have identified in the artwork, families will draw their own images and use them as collage elements to create a collaborative, remixed version of Shaw’s installation.